Encouraged by the response to circle no. 1, I have made circles no.2 and 3. I tried swapping the segments round this time, so one quarter of each doesn't belong with its fellows. I'm not sure I'd bother doing it again: I don't mind it, but don't like it any better than the original version. Having said which it's nice to have a bit of variety. I've stuck them up on the wall with the 9 patches and, for me, now, this starts to look like something. Looking at this post I've just realised: one more and I can make a big 9 patch out of my little ones. That's an idea that pleases me. I am really liking how this is progressing, The stripes are definitely looking more integrated now they are included elsewhere. Lovely work! This looks awesome. I love the combination of squares an circles. It has an organic look to it. I like the mainly soft colours that you've used and the stripes and gold fabrics that take it up a notch. Oh very nice! And good to know that switching out a quarter of the circle doesn't have a big visual or design impact for you. Nothing like experimenting! You seem to be enjoying the process. Just curious: approximately how big are your nine-patches? Yes, the repetition helps me see it better. I agree about switching up the quadrants, it doesn't make that much diff. It will be interesting to see how it develops further. Oh, this is definitely coming together beautifully! The repetition is definitely working and I can't wait to see the next few steps. How you come up with these ideas really fascinates me. You have such a good sense of color and design and handle improv like it's an organic, natural way of working. 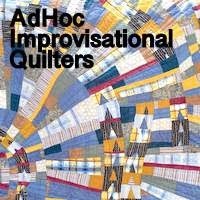 I wish you'd come to a Houston show and teach a class for quilters who struggle with improv (like me). Like how these colors hold it together. Beautiful.